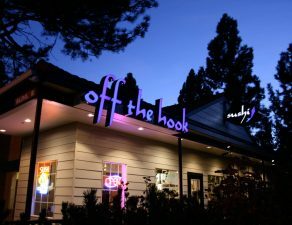 Off The Hook Sushi Lake Tahoe welcomes the super hungry sushi lovers in the area to come feast to their belly’s content. With an especially appealing happy hour, Off The Hook Sushi Tahoe makes it affordable for you to eat well. Off The Hook Sushi Lake Tahoe stands out from other sushi restaurants because of its creative menu. The big selection of menu items at Off The Hook Sushi Tahoe gives you and your friends more wonderful options. Happy hour at Off The Hook Sushi Lake Tahoe also makes eating out more feasible if you’re on a budget. The Creative Menu So many original rolls and sushi creations give your taste buds new flavors to appreciate. Off The Hook Sushi Tahoe doesn’t bore patrons, that’s for sure. The Big Selection Every time you visit, you can try something brand new that you have never tasted before. There are sushi rolls upon sushi rolls for you to try, and experimenting with the flavors you taste can be quite the fun mealtime experience. 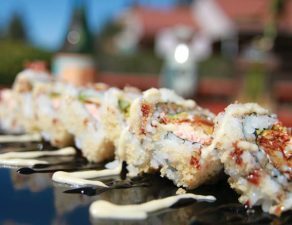 The Happy Hour From the sushi rolls that are priced inexpensively just for the occasion to the drinks that are also lower in price, the happy hour is a lively and popular time to come eat and drink at Off The Hook Sushi Lake Tahoe. Off The Hook Sushi Tahoe hooks you up with a free large bottle of sake when you check in on Yelp. Start celebrating! South Lake Tahoe sushi goes down great with drinks of sake. Dragon Balls: Find the most delicious ingredients filling an Inari pocket. Packed with spicy tuna, shrimp and crab, Off The Hook Sushi Lake Tahoe’s Dragon Balls are one of the most popular menu items here. The creation is deep fried and finished with Thai chili and Tsume sauces. Fire In The Sky: For a crispy and spicy sushi fix, Fire In The Sky is the one you want to order. Spicy tuna, avocado and cream cheese are the ingredients that will awaken your taste buds, and the Tsume and bonsai sauces add the final touch of excellence to the rest of the flavors. Sushi in South Lake Tahoe gets hot with this roll. Family owned sushi restaurant since 2004.